Surgeon Simulator could be making the jump to Switch. A teaser video published today seemingly teases a release on the console. Bossa Studios says more details will be provided “soon”. Didn’t fancy seven years at medical school? Skip straight to the operating table with Surgeon Simulator; an over-the-top operation sim, stitching together dastardly dark humour with all the seriousness of life-saving surgery. Taking on the role of Nigel Burke, a would-be surgeon with a penchant for non-conventional tools, perform critical procedures on patients including The Heavy from TF2, an alien with a truly one-of-a-kind anatomical structure, and the 45th President of the United States of America – yes, Mr Donald J Trump, himself! Known for its diabolically difficult controls (with each finger separately controlled by a different keyboard button), carry out terrifying transplants in theatre, high-pressure procedures along the corridor, and on-the-move operations in the back of a high-speed ambulance. Steady hands? Yeah, that ain’t gonna help! Updated for 2017, Surgeon Simulator now includes the A&E expansion pack. We’re talking slicker (and often stickier!) 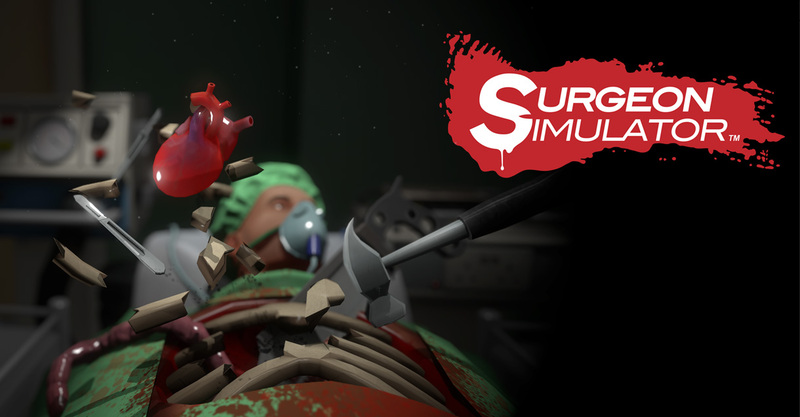 graphics, additional procedures, all-new environments, and a (heart) pumping soundtrack. But then again, we had you at Trump… right?